We at Gary A. Zucker & Associates, P.C. believe that clients deserve strong representation and a fair shake from the law. This is why we offer diligent representation for clients throughout Brooklyn and all over New York City. Working closely with the injured and their loved ones, we have helped many clients receive large personal injury settlements, assisting them and their loved ones along the road to recovery and wellness. Many times we receive questions about the nature of damages and how they are calculated in different kinds of cases. Let's take a moment right now to consider these matters why they should mean something to you. It's common in many cases for lawyers to seek both compensatory and punitive damages for their clients. Let's look at these of these right now, starting with compensatory damages. Calculating compensatory damages is generally straightforward as it involves tabulating various losses and bills. For example, say that a person was injured in a car accident that left the victim paralyzed from the waist down. Compensatory damages would be sought to cover medical expenses, the damage to the vehicle and items inside, the wages lost as a result of the accident, and the estimated future wages that were lost due to the paraplegia sustained as a result of the accident. Also known as exemplary damages, punitive damages refers to damages intended to punish the negligent party in a personal injury case. These are for serious injury accidents where compensatory damages alone are not sufficient given the nature of the injury accident. Calculating punitive damages can be complicated since there are no material losses or actual receipts to refer to in such cases. 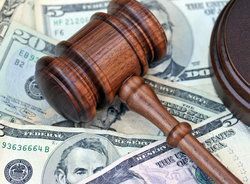 In many cases, the monetary award for punitive damages will be based on similar cases, with the circumstances of the current case taken into account when assessing the final amount. Let's use the person who was injured in the car accident scenario presented above to help provide an example. Say that the auto accident was the result of a design defect in the braking system of a vehicle. The auto maker is considered negligent in this case. If the company knowingly put the vehicle on the market with this dangerous flaw, the punitive damages can be quite high simply given the level of irresponsibility on the part of the auto maker and the number of people that could possibly be affected by the company's decision. If you would like to learn more about your legal options and legal rights in a personal injury lawsuit, be sure to contact Gary A. Zucker & Associates, P.C. today. Our team is eager to meet you in person and we look forward to helping you receive just compensation for your injuries and losses.